The 12-day Grapefruit and Egg Diet combines elements of two other popular fad diets, the Grapefruit Diet and the Egg Diet, into a single meal plan. While such diets may provide short-term weight loss benefits, adherents are unlikely to see these effects persist long after the conclusion of the 12 day period, barring additional weight-loss efforts. The Grapefruit Diet, also known as the "Hollywood Eighteen Day Diet," originated in the 1920s and was designed to provide no more than 600 calories per day. One of the diet's earliest devotees was the novelist Fannie Hurst, who, in 1935, wrote "No Food with My Meals," a memoir about her struggles with weight loss. The Egg Diet, on the other hand, originates several decades later as an offshoot of the Atkins Diet, which was first introduced in 1972. The primary characteristics of the 12-day Grapefruit and Egg Diet are that it is high in lean protein and low in both carbohydrates and overall calories. The breakfast meal consists of two hardboiled eggs and half of a grapefruit. For lunch, roast chicken without skin, a green salad an another half of a grapefruit. Dinner is another half of a grapefruit accompanied by a two-egg spinach-and-tomato omelet. In one of the more extreme variations of the diet, all three meals consist of hardboiled eggs and grapefruit. In 2008, the American Dietary Association acknowledged that low-carbohydrate diets can provide weight loss benefits for certain individuals, such as diabetics. However, the ADA also stated that the long-term effectiveness of any diet depends largely on an individual's ability to maintain it. The 12-day Grapefruit and Egg Diet is lacking in both nutrients and variety, which may explain its limited duration. The ADA continues to advise against following fad diets, recommending a moderate diet combined with regular exercise instead. While the 12-day Grapefruit and Egg Diet may provide short-term weight loss benefits, severe carbohydrate restriction may also limit your energy reserves, making strenuous physical activity feel more difficult. Other potential drawbacks may include flatulence, constipation and unpleasant breath. 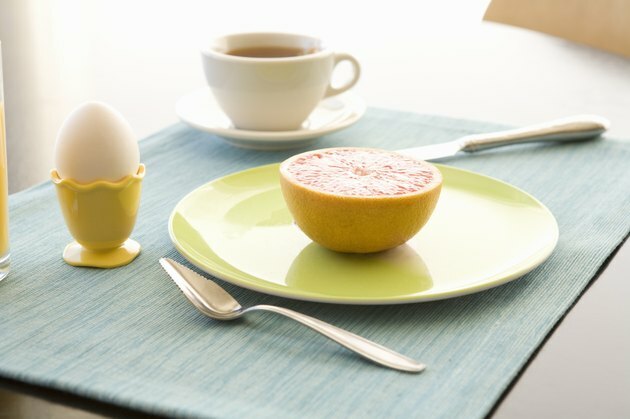 Grapefruits and eggs can be healthy sources of vitamin C and protein, respectively, but you may find better results by incorporating them into a balanced diet that is low in simple carbohydrates, such as those found in sugary foods and white bread; such a diet may also prove more palatable in the long run. Before making any drastic changes to your diet, however, first consult with your doctor or dietitian.